I was full of good intentions to post some thoughts on the #edchatnz conference last week but, by some weird, cosmic coincidence, last week was also my first one as an employed (albeit part-time) teacher. Good timing in many ways but finally having an actual class to teach has tended to dominate my thoughts over the last few weeks and it has taken me a while to revisit my #edchatnz experience. I had heard of Pond but knew little about it so that was my reason for choosing this session. The first part of the session was more a pitch for the company rather than information that I would find useful. I could have done with far less of that. Once the speaker got onto Pond, things got much more interesting. The three column search concept sounded useful and the idea of teachers being able to recommend resources will hopefully add value. I was sitting next to a current user of Pond who was far from convinced but I saw enough in the session to want to dive in and see for myself. Turns out that digital citizenship isn't what I thought it was (although it is more what I thought it should be). This was a very engaging session with quite a bit of audience feedback. My big takeaway from this presentation was the importance of teaching and modelling good online practice so that as children start to explore more on their own, they have the skills they need to manage their own safety. Unfortunately, I had to leave early and missed most of this. It was much more interesting than I had expected. The main point of this session was that modern learning environments do not depend on cool furniture but on pedagogy. I certainly want to learn more about My Learning (Emma Winder). This was a very stimulating session by Steve Mouldey. His discussion on brainstorming made me rethink a lesson I had planned for my new class (and I think it was much better as a result). I came away from this session much more impressed than I expected. I gave Booktrack a brief go (as a reading experience) a few months ago and quickly decided that reading with a soundtrack was not for me. Of course, not everyone is me so I went to investigate with an open mind. I was surprised to find that Booktrack doesn't only supply soundtracks, it also allows you to create your own. I was pretty excited about the possibilities in the classroom for this and hope to use it in the near future! 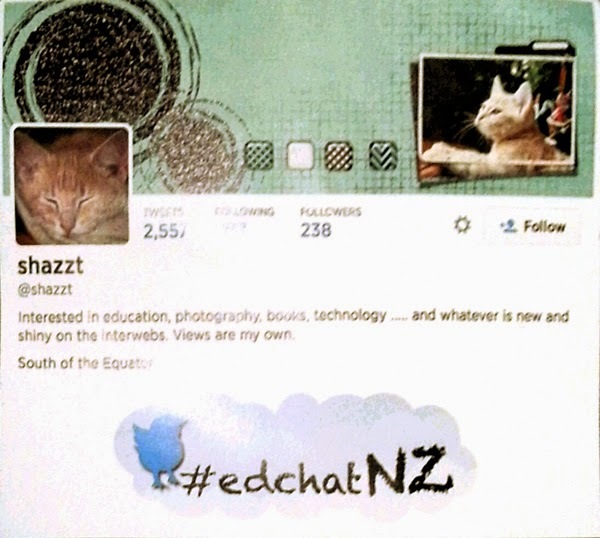 These short snippets do not do justice to the stimulating material that was presented at #edchatnz. The organisers do a fantastic job and this (unemployed at the time of registration) teacher certainly appreciated the insanely cheap price. Can't wait until next year!